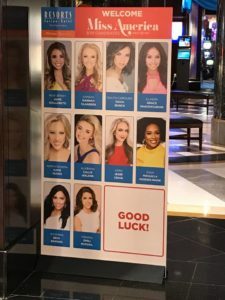 Walking into the 2019 Miss America Competition, I didn’t really know what to expect. But even though my 50 sisters and I were blindly walking into the experience, we had the time of our lives. 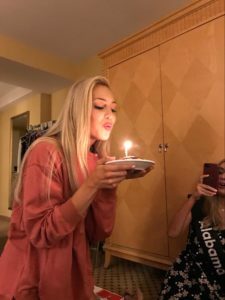 I will be blogging more about Miss America throughout my year, but I wanted to start off with ten of the highlights that made the experience so memorable. 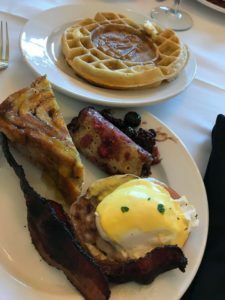 Each day we were allotted a $25 stipend to purchase room service. You could also use that stipend in the hotel restaurants! For someone who is a big foodie like me, this was a dream come true. 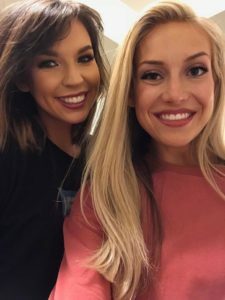 Having cookies or Eggs Benedict delivered to me late at night and chatting with my roommate, Miss South Carolina, wasn’t anything flashy, but it is a sweet memory I won’t forget. Miss Idaho and I decided to ride the Slingshot together (if you’re familiar with Lagoon Amusement Park in Utah, it’s the same ride as “Catapult”). I was pretty nervous because I hadn’t ridden a ride like that in ten years. The anticipation of the takeoff (as pictured below) was the scariest part but the ride itself was a blast. I almost lost my fake eyelashes in the process, but it was totally worth it. Our first dinner all together took place at Bocca, and some girls asked me if it was my birthday because a Miss America board member had communicated to them that it was. I rightly replied “no,” because my birthday happens to be December 29th and not August 29th. Apparently, there had been a mistake and Miss America believed my birthday to be August 29th. 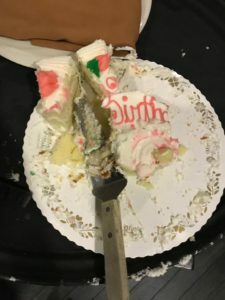 They brought out a cake which had a name wiped off of it, and we ended up singing to Miss Louisiana whose birthday came a few days later. Later, my hostesses celebrated my unbirthday as well. It was very unexpected, but it was so fun to celebrate my birthday four months early and at Miss America! One of our appearances was the Harry’s Oyster Bar Clambake. The food was delicious (I got to try oysters and mussels for the first time!) and then we danced the night away. Miss America 2018, Cara Mund became a DJ, we did the Cupid Shuffle and The Wobble, and we danced to “Don’t Stop Believin’.” It was so nice to let loose and have fun with one another! 5. Hostesses, Security, and Raging Resorts! 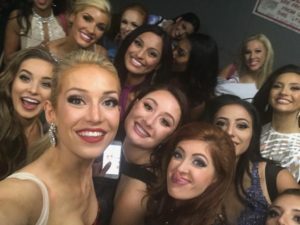 Miss Iowa, Miss Alabama, Miss New Jersey, Miss South Carolina, Miss Wyoming, Miss Illinois, Miss Virginia, Miss North Dakota, and Miss Kansas were all in Resorts Hotel with me. We had four hostesses: Peggy, Gaye, Joyce, and Sandi and would meet up with them at the end of every day to have a meeting and hang out. One of my favorite memories was our final night together where we had a pizza party with everyone including our security guard, Chris, and we just relaxed. We were all such a great crew and got along so well. Chris and the hostesses would take us down to the food court late at night if we were extra hungry, and we would all have a blast on the jitney together. Walking on that stage for the first time was an experience I’ll never forget. Two years previous I sat in the audience dreaming of my chance to stand on that stage, and my dream came true. I teared up thinking about how many incredible women had stood there before me, and for how long I had dreamed of standing there. I had to pull myself together a few times for rehearsal because I felt so grateful! The energy for our final night was insane! Backstage we were so excited. I kept screaming – yes, screaming (but a muted scream). I couldn’t wipe the smile off of my face when the telecast began. I was living my dream! This was real! I was standing next to Miss Ohio, Miss Wyoming, and Miss Alabama…and we were on TV! When the final fifteen were called, I was so excited for my sisters. I SCREAMED when Miss Idaho made it! She is one of my favorite people, and we were practically glued at the hip throughout the duration of our time in Atlantic City. Having her make it into the finals felt like I had made it. Throughout the rest of the night, I loved being able to cheer her on and watch her succeed in each phase of the competition. A bonus surprise was finding out about my Non-Finalist Talent Award while watching the telecast. 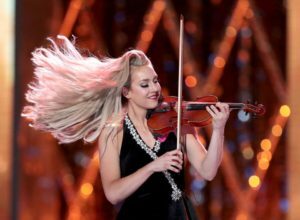 Performing my violin on the Miss America stage was incredible. I felt very calm and in control with my performance, and I was glad that I got to showcase a piece that had my whole heart invested into it for nearly three years now! Receiving the Non-Finalist Talent Award was the cherry on top. Walking in my evening gown was also a fantastic memory. I stood at the top of the stairs waiting for my name to be called and I looked around and let the reality that I was at Miss America sink in. I got a little misty-eyed but had to pull it together so that I wasn’t sobbing when I delivered my statement at the end of the red carpet. Before the parade started, it was windy, wet, and so cold that I was chattering. I thought that I would end up just sticking my shoes out the window of the car because none of us wanted pneumonia. But God smiled down on the Boardwalk and the weather eased up! Seeing my family and friends, having people all along the Boardwalk shouting my name and wishing me luck, and showing my pride for my University made the experience so incredible. I took a moment to let it sink in that I was on the Boardwalk for the Show Us Your Shoes Parade and I felt so grateful. I walked away from the parade feeling so rejuvenated and loved that I was at peace with whatever the outcome would be for the final night of competition. I loved getting to know my Miss America sisters. Some of my favorite memories will always be awkward dancing with Miss Idaho, doing a pushup challenge with Miss Illinois, having a late night picnic in my hotel room with my Raging Resorts girls, driving crazy on the golf cart with Miss New Mexico, hitting up the dessert table with Miss DC, doing a dressing room ab workout with Miss New York (now Miss America!! ), singing songs from the Wicked musical with Miss Kansas, hanging out and eating pizza with Miss Mississippi, and hugging all of my sisters when it was all over. Miss America was one of the best experiences of my life. I am so lucky to have lived out this dream, and I can’t wait to continue my dream of serving as Miss Utah 2018!